A hilarious comedy from "The Israeli Monty Python"
The biggest Israeli blockbuster in 25 years! Set in biblical times, This Is Sodom tells the story of the birth of Monotheistic faith, following the last few days of Sodom, the most famous Sin City in history. In this satirical comedy God is a young and ambitious entrepreneur trying to recruit his first customer, a cranky old man named Abraham. Old Abraham is a fearless negotiator, with a "deal breaker" demand: the immediate rescue of his nephew Lot - the only righteous man in Sodom - from the city which is about to be obliterated. The task of rescuing Lot is bestowed upon Raphael and Michael, two angels, who are on their way to Sodom to destroy it. Unfortunately the message is intercepted by Sodom's infamous King Bera. The evil king comes up with a devious plan: he'll disguise himself as Lot, attempting to fool the two into rescuing him instead. Who will be saved? The righteous man or the biggest sinner? Does God even give a damn? And what will be the fate of the only town in the Bible that knew how to party? Since 2003, “Eretz Nehederet” (“A Wonderful Country“) has been the most successful TV show in Israel. Every Friday night, nearly 60% of the viewing audience tunes in to watch the country's leaders and politicians ridiculed. This satirical show caught the attention of prominent international media outlets such as The New York Times, ABC's 20/20, BBC News, CNN, and ARTE. 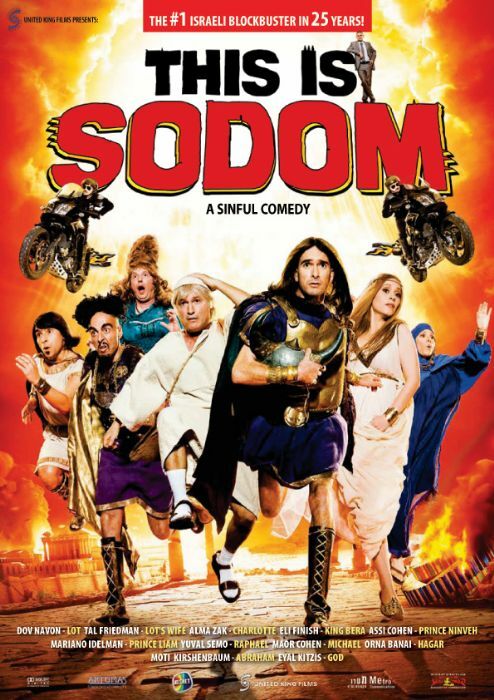 Now, the all-star cast of comedians, dubbed the “The Israeli Monty Python” is coming to the big screen, with the hilarious comedy This Is Sodom. Within the first few weeks the movie proved to be a huge success, breaking all previous box-office records and becoming the most profitable film in Israel in 25 years.